Can Advantix be used with Nexguard Spectra? Yes, you can use Advantix with Nexgard Spectra safely together. This is slightly different than Advantix II. Bayer sell the original Advantix in Europe. It does the same job but formula is little different. This says over 55 pounds. If my Mastiff is 120 pounds is it still effective? Or is there a max weight effectiveness? Thank you! This is the biggest size for Advantix. This should work fine on your dog. can you give advantix with heartguard? Yes you can combine with these two products safely. 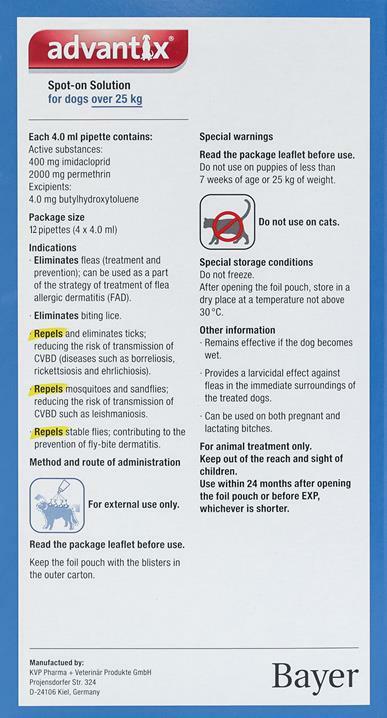 But we recommend to get advice from your vet before administer any medication to your dog. The product is identical and from the same manufacturer (BAYER). The only difference is it is packaged for different market.